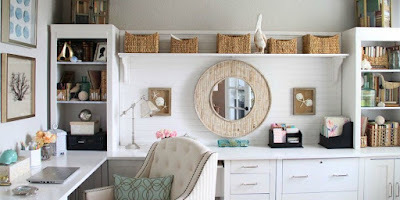 If you are one of the many who work from home, my guest blogger Chloe Taylor has some great ideas for creating a beautiful home office. In the last few years the number of people working from home is constantly increasing and we have raised our bar when it comes to home office designs. It is no longer enough to have a chair to sit on and a laptop to use. Now we expect our home offices to be functional, beautiful and to encourage productivity. Fortunately, designing such an office is much easier than it seems, and it can also be light on our budget. Do not believe us? Here are some tips on how to turn an ordinary room into a real deal home office. Yes, something so simple can actually make a huge difference. 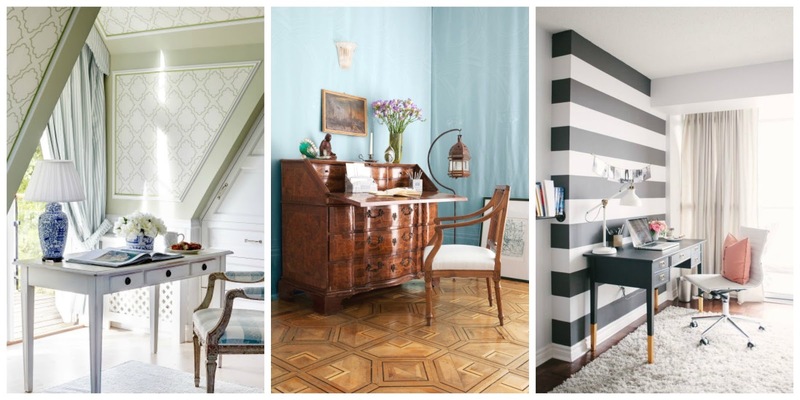 Take a bucket and a brush and start designing your home office. Keep in mind that some colors will affect your emotions and mind, and they can make you more focused and productive. Choose the combination of high-saturated (better stimulation) and low-saturated (soothing and de-stressing) shades. The best colors to get your motors running are blue, green and yellow. When choosing a room for your home office, make sure it lets plenty of natural light in and put your desk near the window. If you do not have such a room available, do your best to compensate the lack of sunlight with layered light sources. Use LED bulbs to save some energy, but do not make it all about the electricity, make it about style too. Desk, floor and wall lamps can be great decorative elements. 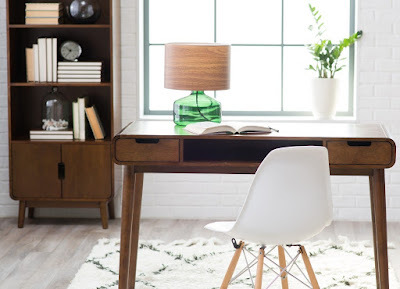 Choose lamps in bright colors to make accent pieces, and make sure they match the overall style of the office. Work area is literally the most important part of your home office. It needs to be pleasant, functional and above all comfortable. Office furniture experts from Sydney point out that the negative effects of prolonged sitting can be alleviated with the right furniture. Namely, the office desk should be of the ideal height, meaning that it should be restful for your hands if you keep your elbows at a 90 degree angle on the desk. The chair on the other side should be ergonomic, with a lumbar support cushion. 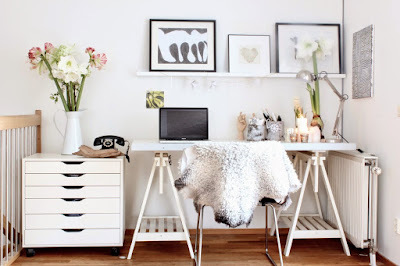 If the room you have chosen to be your home office is small, you might have troubles storing all the necessary items. There are, however, many solutions for those problems. Vertical storage is the most efficient way to save some space, but you can add labeled baskets and bins to that and store them under your desk. Open shelving is a neat solution when you are low on space. There are some DIY projects that will make storing much easier, like mason jars cubbies, hanging notepad, rolling book basket, storage containers, pencil holders, hanged storages, etc. It is your office, but it is also situated in your home, so it has to be cohesive with the rest of the home décor. A nice cozy rug in the middle of the room is just what you need to achieve that. Art pieces hanged on the wall, or even better, drawings of your kids, will also contribute to that feel. You can also hang motivational posters to keep you going (Remember Marge Simpson and her “hang in there kitty” poster?). To make the space even more pleasant, add romantically patterned curtains, wall clock, a vase with fresh flowers, and why not, even a comfy armchair, for coffee breaks? See, it was not that hard. One last thing, though, make the space more personal by adding some accessories you love (e.g. your lucky elephant figurine or an old wooden case you got from your parents), some lovely scented candles, etc. That way you will create an environment where you feel completely pleasant working in, which will make you far more efficient in the job you are doing.